On Sunday, August 10, 2008, we had the joy of hearing Stavroula Loupa profess Christ as her personal Savior. She was brought up in the church, being the youngest of her family of five, who have been active members and a real blessing to this local body of Christ. 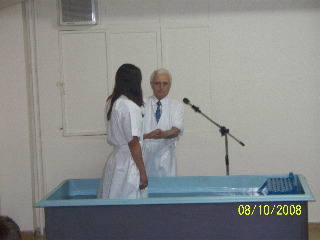 Stavroula was baptized after the evening service in an atmosphere of joy, emotion and praise. Kisses and hugs followed her coming out of the baptismal waters, and, with one heart, all present, wished her God's richest blessings in her new life as a full member of the church. A prayer by Bro. Markos concluded the service, with a unanimous wish that many more such happy events might follow!